CAMBRIDGE, Mass. (AP) — U.S. Sen. Elizabeth Warren and congressional candidate Ayanna Pressley are headlining a "Unity Rally" for the Massachusetts Democratic Party. The Sunday event happens at the Cambridge Community Center in Warren's hometown of Cambridge. Warren and Pressley are expected to speak about the importance of supporting Democratic candidates in the November election. BOSTON (AP) — If not for Boston City Councilor Ayanna Pressley's upset win over longtime incumbent U.S. Rep. Michael Capuano in the Democratic primary, attention this week might have shifted to the defeats of two veteran Democratic Boston state lawmakers. BOSTON (AP) — The black Boston city councilor whose upset primary win over a 10-term congressman stunned Massachusetts' political establishment called her victory "surreal" Wednesday and said the wave of inclusiveness sweeping the nation is the best way to counter President Donald Trump. Ayanna Pressley, the Democrat poised to become Massachusetts' first black congresswoman, is suffering from dehydration. Pressley's campaign manager said Wednesday that "after an intense few days on the trail and a unity event this morning, Councilor Pressley is dealing with some symptoms of dehydration and exhaustion." PROVIDENCE, R.I. (AP) — A Democratic gubernatorial hopeful in Rhode Island says Ayanna Pressley's upset primary victory over a longtime Democratic congressman bodes well for his campaign. 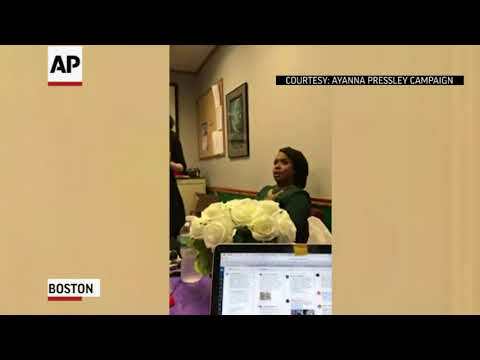 BOSTON (AP) — Ayanna Pressley is all but assured of becoming the first black woman elected to Congress from Massachusetts, the latest example of the Democratic Party's embrace of diversity and liberal politics as the recipe for success in the Trump era. BOSTON (AP) — Boston City Councilor Ayanna Pressley stunned fellow Democrats by defeating incumbent U.S. Rep. Michael Capuano in a closely watched Massachusetts primary battle Tuesday. Pressley is virtually assured of becoming the first black woman elected to Congress from Massachusetts in November, and her victory gives Democrats' progressive wing another win in their effort to pull the party leftward. BOSTON (AP) — In a political stunner, incumbent Democratic U.S. Rep. Michael Capuano lost Tuesday's primary to Ayanna Pressley, a Boston city councilor who is virtually assured of becoming the first black woman to serve Massachusetts in Congress. BOSTON (AP) — Ayanna Pressley is attempting one of toughest political feats in Massachusetts — persuading Democratic voters to reject a long-time incumbent during a primary. Making the task even more difficult? Pressley has acknowledged she'd likely vote much the same way as incumbent U.S. Rep. Michael Capuano. BOSTON (AP) — The parents of one of the 17 people slain at the Parkland, Florida school shooting will join gun-control advocates and a city councilor at an event in Boston designed to call attention to gun violence. Organizers say the event will be held at City Hall Plaza on Monday. They're calling it a "Back to School Fashion Show" and say models will walk on a catwalk sporting "provocative wear" such as helmets and bulletproof vests. BOSTON (AP) — The Democrat challenging U.S. Rep. Michael Capuano in next month's primary in a key Boston-area congressional district acknowledged Tuesday that if elected she would likely vote the same way as the incumbent, but insisted leadership was about more than casting votes. BOSTON (AP) — From cracks at President Donald Trump's lawsuits, to jokes about a video of Gov. Charlie Baker's holiday bar hop, Boston's St. Patrick's Day breakfast Sunday was a hoot to many. BOSTON (AP) — U.S. Rep. Michael Capuano of Massachusetts says he welcomes a Democratic primary challenge from Boston City Councilor Ayanna Pressley. Capuano said Thursday that he's known Pressley for many years and believes she'll make a "good candidate" for the seat. Capuano has represented the 7th Congressional District since 1998. He said the primary challenge will not change his approach to campaigning and believes his record in the House "speaks for itself." 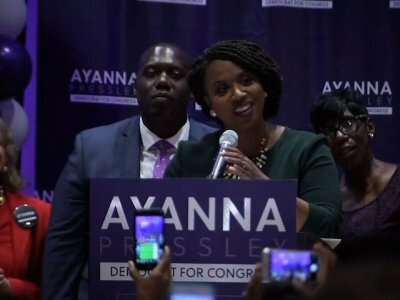 BOSTON (AP) — Boston City Councilor Ayanna Pressley has decided to challenge incumbent U.S. Rep. Michael Capuano in the Democratic primary for the state's 7th Congressional District. Pressley said in a statement Tuesday she made the decision after prayer and deliberation. She said residents of the district need more than just an ally, they need an advocate and a champion. Pressley has served on the city council since first taking office in 2010. Tufts Medical Center nurses went back to work yesterday — but the financial hit to the hospital from last week’s strike, the financial hit to nurses from the lockout that followed, and the raw nerves that inevitably come with such labor disputes linger on. U.S. Rep. Michael E. Capuano came out against uncontrolled immigration and said he’d oppose a politically motivated impeachment of President Trump at a community meeting last night in Roxbury. BOSTON (AP) — Some Boston commuters are getting a free ride for the next two weeks. U.S. Rep. Michael Capuano and state Transportation Secretary Stephanie Pollack say starting Monday and ending May 21 rides on the MBTA's Fairmount Line will be free. The program is being paid for with $53,000 from the Massachusetts Democrat's campaign funds. U.S. Rep. Michael Capuano took aim at his own party at a town hall meeting in Somerville last night, blasting Democrats for pursuit of ideological perfection over viable candidates. A local veterans advocacy group that is slamming Bay State Democrats for supporting illegal immigrants while Massachusetts veterans are in dire need of critical services will relay its message to millions of people from coast to coast this morning on Fox News’ “Fox & Friends” program. SOMERVILLE, Mass. (AP) — Immigrant youths and business owners are rallying in Somerville following President Donald Trump's moves to crack down on illegal immigration. Organizers of "We Are One Somerville" say they're coming out Saturday morning to Somerville High School to show support for the city's status as a so-called sanctuary city where limits are placed on the local police department's cooperation with federal immigration agencies. BOSTON (AP) — A second member of Massachusetts' all-Democratic congressional delegation has decided to skip the inauguration of President-elect Donald Trump. Rep. Michael Capuano said in a series of tweets Wednesday that although he has great respect for the office of the president and accepts the result of the November election, he won't attend the inauguration. BOSTON (AP) — U.S. Rep. Michael Capuano is asking federal investigators to look into whether the state's commuter rail operator violated civil rights laws. The Boston Globe reports (http://bit.ly/2dQFEY8 ) the Massachusetts Democrat wants the Department of Justice and Federal Transit Administration to review a decision by Keolis Commuter Services to take trains from a line that serves lower-income communities to use on suburban lines.